I tried out two Clean Well products. In converting to natural and organic products, cleaning products is important too. If you look at many other brands they contain toxic chemicals. Clean Well's formula uses the antibacterial properties of the thyme plant. This makes the disinfecting wipes safe to use around kids, pets, and food. These wipes are great for cleaning kitchen counters and most surfaces around the home. I used them on a coffee table and it made the wood shine. It kills 99.9% of germs botanically. I also feel safe wiping down the toys with these. The Lemon Scent was pleasant and you can smell the thyme, which just makes me think of cooking. 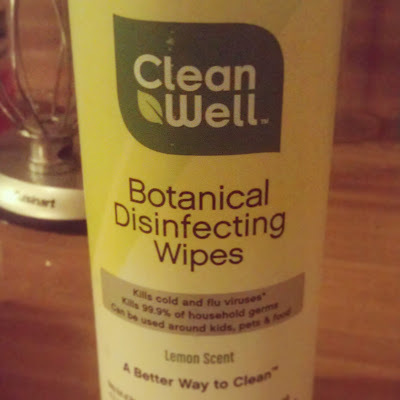 I am happy to swipe out my old disinfecting wipes for Clean Well wipes. I really enjoyed the orange vanilla scent for the hand sanitizer. It is safe for children to use. The size is perfect for fitting inside a diaper bag or even a small purse. I will stock up on these so my husband can take it to work. Alcohol free is a plus. Other sanitizers dry out my hands. Their hand sanitizers also come in wipes. Connect with Clean Well on Facebook or Follow them on Twitter. Clean Well products are available at Whole Foods Market, The Vitamin Shoppe, Amazon.com, and many other retailers. 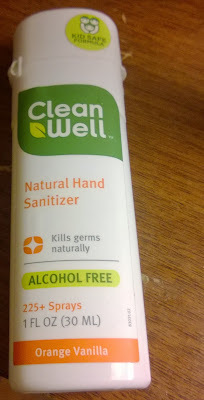 Do you carry hand sanitzer when you go out?